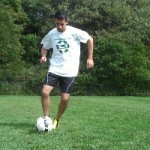 All soccer players have a preferred foot they use for dribbling, passing, shooting, etc. It doesn’t mean that the other foot can’t do anything, but maybe it doesn’t do it as well as the preferred foot. So how do you improve your so called “weaker” foot? The reason your preferred foot does its job so well is because it’s used to it! During practices and games, you use it all the time. It remembers the feel of the ball, exactly where on the ball to step on or strike. It’s a repetitive motion. It becomes an extension of your mind. You tell it to do something and it already knows how to do it and does it well because it has done it so many times before. So how do you improve your weaker foot? You guessed it: practice, practice, practice! 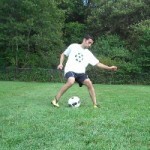 If you want to be able to shoot or pass with your weaker foot, you need to practice shooting and passing. The more you shoot and pass with your weaker foot, the more it learns the touch of the ball, the motion it needs to accurately strike the ball where you intend it to go. Repetition is key. Dribbling and faking with your weaker foot is the same idea. The more you dribble and practice moves with your weaker foot, the more it learns the touch of the ball, the weight needed to push it forward or back, etc. So get out there and start practicing with your weaker foot. Challenge yourself with the goal that you will no longer have a “weaker” foot. You will elevate your game to new levels and your opponents won’t know what to do with you!